Philosopher and Biblical commentator; born at Saragossa at the end of the fifteenth century; died about 1556 in Salonica. His father was exiled from Spain in 1492 and died in Naples. Meïr Arama, who had gone thither with his father, remained there until the French army invaded Naples in 1495. He then went to Salonica and settled there, devoting himself to literary pursuits. 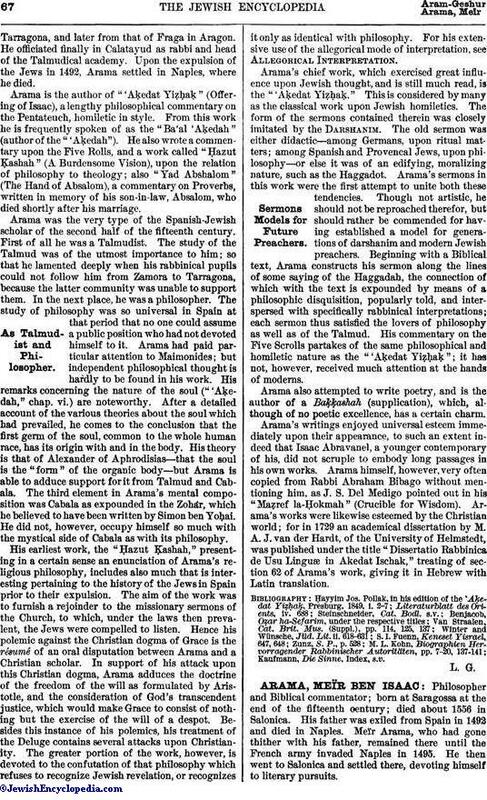 Arama is the author of the following works: (1) "Urim we-Tumim" (Light and Perfection), a philosophical commentary on Isaiah and Jeremiah, published by Menahem Jacob ben Eliezer Judah, Venice, 1603; (2) "Me'ir Iyyob" (The Illuminator of Job), commentary on Job written in 1506, and published, together with the text, at Salonica, 1517; (3) "Meïr Tehillot" (The Illuminator of the Psalms), commentary on the Psalms, written in 1512, and published, together with the text, at Venice, 1590; (4) "Perush," commentary on Song of Songs, published in the Bible of Amsterdam 1724-27, which latter bears the title "Ḳehillot Mosheh"; (5) commentary upon Esther, still extant in manuscript (Codex Rossi, No. 727). 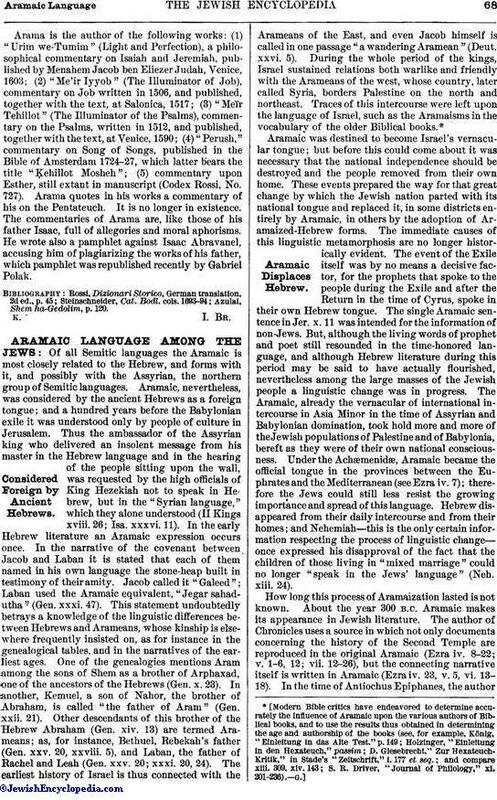 Arama quotes in his works a commentary of his on the Pentateuch. It is no longer in existence. The commentaries of Arama are, like those of his father Isaac, full of allegories and moral aphorisms. He wrote also a pamphlet against Isaac Abravanel, accusing him of plagiarizing the works of his father, which pamphlet was republished recently by Gabriel Polak. Azulai, Shem ha-Gedolim, p. 120.